My home is ready to cup itself around a Sufi gathering. There is plenty of space for a small group to stand and move and lie down without having to move furniture. The house is always clean since Cape Cod is clean. In the entry foyer and adjacent Sitting Room, guests leave shoes and coats and bags and their outside thoughts. This Beginning takes a little time and it is wonderful to have a room for it. We trek through the kitchen, set with the tea things for later, into the parlor, its southern exposure filled with warmth and light from the winter sun’s low arc. What a relief after tiresome years of renting space which provided enough elbow room, but were often too cold or noisy or designed for something else. For example, a yoga studio, usually a pristine, sometimes sterile space, but that sticky floor which is so helpful for gripping in asana causes torque in knees and hips and ankles when you spin or flow or glide around the room. Or gruff, harshly-lit martial arts dojos smelling of sweat. Ballet studios with rosin-powdered floors have a crass, unavoidable mirrored wall which must be covered, which means schlepping obscuring veils and string, and requires set-up and break-down time. Or blowzy belly dance studios with their cats and cat hairs. Even my darling Elizabeth St. apartment in NYC was an effort. It was small and required that I move things, rearrange things, clean a lot (because NYC is dirty), stow things, and then I’d be anxious that I’d overbooked the session, which I usually did since typically one or two people would cancel, but sometimes they didn’t, and we were very crowded. Being nomadic, having to adjust to and rise above adverse conditions, is a strong practice. It taught me what works and what detracts, not only for the group but for me. In Woods Hole, my preparation is minimal and discomfort nonexistent. The practice and the group are supported. This will be true of Ravenrock as well. How wonderful to come home. In the parlor, people put out their sheepskins or mats or blankets, got sorted, and we began. I lead 10′ minutes of standing Breath Dance then everyone was off on their own for 30′. 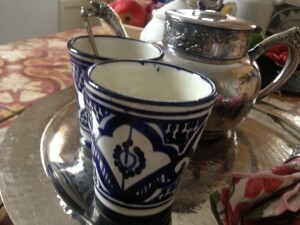 After, a brief, quiet rest, followed by a verbal partner exchange focused on the movement experience (with eyes closed to assist in remembering and including the body as much as possible) and, finally, mint tea altogether with conversation that expanded as much as it liked. I closed my eyes and entered my meditation. I felt, not surprisingly, an extreme dissonance between a familiar ease of being ‘as always’ in my practice, and the newly cultivated need for caution and careful restriction of motion in my pelvis and hips. I noted that my hips and thighs felt dense and heavy, however they are still mending and prefer not to be scrutinized. ‘All of me’ understands well that when it comes to mending, my mind can be spectacularly unhelpful, pushing and prodding and impatiently rushing. I turned my attention elsewhere, especially in the first stage of the meditation process. Later, after tea, the sun slid behind the treetops. I stood to light the candles on the mantlepiece. It was time for us to finish and return to our individual worlds. We had a little exchange about tithing, said our goodbyes and, when the door closed, I felt lighter and happier. Nothing extreme, just that unique, distinct sense of integration which often comes with my practice. Baraka. The sensation doesn’t just lodge in my heart but goes through and through me. It is far less violent then what I have been progressing through for a year. I almost laughed. Reading this was a tiny bit like being there… and the tiny bit was oh so welcome, so powerful. Much love to you, Dunya.